I really need to get into the habit of writing down my favourites throughout the month! August’s favourites are sparse, featuring just 3 items, but 3 very worthy items nonetheless. First is my denim skirt from asos. As mentioned in a previous ootd, this skirt is my favourite summer purchase, I’ve practically lived in it for the past 4 weeks. My second favourite of the past month is Paco Rabanne’s new perfume – Olympea. Jamie kindly treated me to a perfume shop voucher back at Christmas and I finally found a scent to spend it on! I just wish I had bought a bigger bottle now! 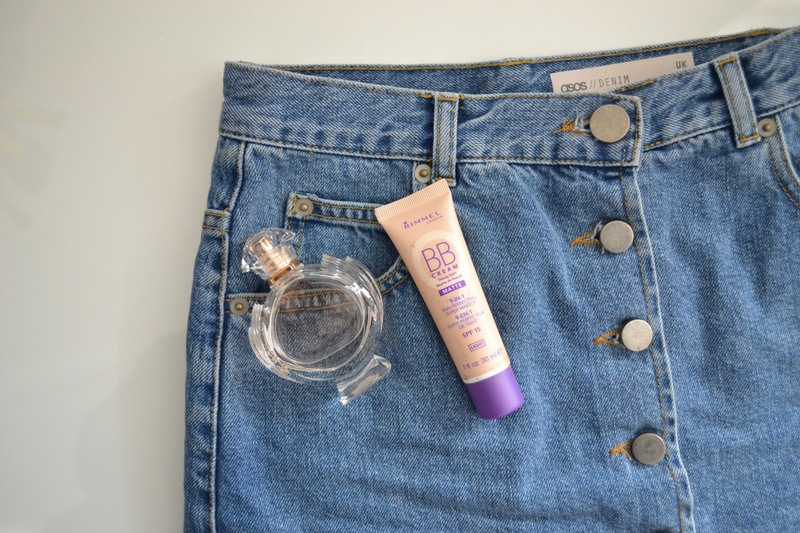 Finally a beauty fave – Rimmels BB cream. Previously I’d been using a quite thick and high coverage foundation from Maybelline, and although I still use it occasionally, I’ve found myself reaching for this a lot more, especially during the daytime. It has a really light feel but covers just enough! In terms of things that have happened this month, one very special thing stands out – a trip to London for two nights for Jamie’s 18th Birthday. It was so lovely to spend a couple of nights away with him to celebrate, even if we were woken up at 3am by the fire alarm!! Another favourite of the month would be results day. Although my university offer was unconditional so ultimately grades didn’t matter, I was super proud to find I’d done way better than expected, finishing with the grades AAB in A-Levels. Probably better not to talk about the celebrations that followed, it was messy. P.S. I go to New York TOMORROW! How is that even possible? I’m super duper excited.